We may already know the retail price for Nintendo Switch if a new report is correct. Let's Play Video Games cites two anonymous sources with inside knowledge of UK retailer GAME who says it plans to price the base system at £199.99. That roughly converts to $249.99. I estimated a low-end price of £249/$299 for Nintendo Switch after I heard that Nintendo wouldn't sell the systems at a loss. But LPVG's figure is just one notch down, more or less, and is still in the realm of believability. 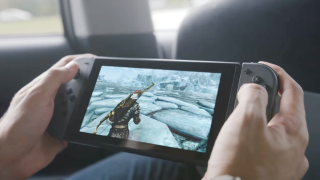 According to the same report, a higher-end Switch package with more internal storage and an unspecified packed-in game will be sold for £249.99/$299.99. And Switch Pro Controllers - those are the ones that look like regular game controllers, not the detachable Joy-Con grip - will reportedly go for £39.99 (or probably about $59.99). Nintendo doesn't plan to share or confirm any more details about Switch until it hosts a big debut event in January. Hopefully we'll learn the official price point(s) there and what, if any, game Nintendo plans to include with the console. Here's hoping for The Legend of Zelda: Breath of the Wild, that would make my shopping trip a little easier.